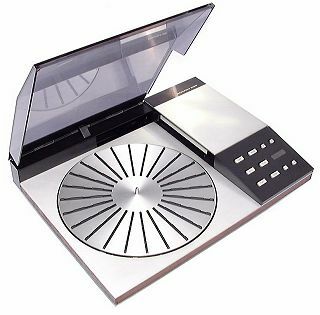 The Beogram 8000 was the turntable designed to work with the Beomaster 8000 in the Beolab 8000 system. As the Beolab 8000 was intended to be the highest quality domestic audio system that B&O had ever marketed and the LP record was the best source available at the time, there was considerable pressure on the designers to come up with a really high performance product. Text copyright © Beocentral. Unauthorised reproduction prohibited. 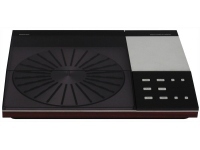 The Beogram 8000 was the first model in a second generation of high-fidelity B&O turntables. The Beogram 4000 had been the first, and this model (and its derivatives) had been the basis of all B&O’s top-line systems during the 1970s. Despite being the subject of almost constant revision, the Beogram 4000 series had remained substantially unaltered in structure, concept and appearance. A further re-working of the design was not considered appropriate, so most of the Beogram 8000 was new. Text copyright © Beocentral. Unauthorised reproduction prohibited. Like the rest of the Beolab 8000 system, the basis of the new features and techniques in the Beogram 8000 was microprocessor control. Though easy to find uses for in a receiver or a tape recorder, the applications for this technology were less obvious in a turntable, whose function is essentially mechanical. Nevertheless, the finished product included a fully integrated microprocessor which helped make the Beogram 8000 easy to use and capable of high quality results. Text copyright © Beocentral. Unauthorised reproduction prohibited. The Beogram 8000 was similar to the Beogram 4000 in some respects. The arm and platter were of similar appearance (though different in detail) and operated under the same principles. The same series of plug-in pickups were also used and both machines were about the same size. What really set the two types apart was the method use to rotate the platter. The Beogram 8000 used a new system called “Tangential Drive”, a form of direct drive that used “linear motor” technology to give smooth, silent and controllable power to the turntable. In simple terms, the motor coils placed a magnetic field at a tangent to a metal drum under the platter. This had the effect of pulling the drum through the coils in a manner that was smooth and free of “cogging” and “stepping” effects. This layout was at odds white the techniques used in the typical Japanese direct drive turntable, which tended to use hall-effect motors based around rotating magnetic discs and multiple electronically-commutated coils in an arrangement that was fundamentally not “stepless”. Text copyright © Beocentral. Unauthorised reproduction prohibited. While B&O’s tangential drive could have been regulated by analogue means alone, the presence of the microcomputer presented an opportunity to control the process digitally and so add the precision of the microcomputer’s quartz crystal to the formula. By sensing the rotating speed of the platter with an encoding ring fitted to the turntable shaft, the microcomputer could be included in a “closed loop” system, permanently ensuring perfect speed accuracy. As B&O’s turntables were frequently bought by musicians, it was desirable to include a “pitch” adjustment. This was easily included in the Beogram 8000 and for the first time a speed display was fitted so that the amount of pitch correction could be recorded and easily returned to. The system allowed the speed to be adjusted in 0.05 RPM steps at 33 1/3 RPM and 0.07 RPM steps at 45 RPM. The display also showed when the speed control servo could not lock by flashing all the digits on and off. Text copyright © Beocentral. Unauthorised reproduction prohibited. A quirk of the tangential drive system was that when the driving coils were not energised the platter was left to turn freely. Because of the high quality bearings used, this would have meant that after the machine was stopped it would have taken a very long time (about half a minute) for the record to stop turning, making it difficult to remove. To counter this possible nuisance, an electronic brake was fitted that used the driving coils to bring the platter to a swift halt. The braking force was applied progressively to give smooth results and the overall effect was similar to that observed when a conventional belt-drive turntable is switched off. Text copyright © Beocentral. Unauthorised reproduction prohibited. The microprocessor was also used to control the arm. The previous models had relied on a series of switches to determine the arm set-down points and to sense when the record had finished, something that could go out of adjustment. In the Beogram 8000, the rotations of the lead screw that moved the arm were counted so that the microprocessor always knew exactly where the arm was. Because of this, all the important positions could be stored in the program memory and this was free of drift and wear. All that was required to set the system up was to adjust the “home” switch so that the arm started from the correct place. The increased flexibility of this arrangement meant that the “pause” mode could be improved, after a few seconds the arm would return to the safety of its rest position but was still able to come out and carry on in exactly the same spot when requested to do so. Manual cueing was still possible, using two progressive control keys that made the arm move faster the harder they were pressed. Interestingly, this function, along with the tracking during play, was performed by conventional analogue circuitry. Text copyright © Beocentral. Unauthorised reproduction prohibited. The other arm function to come under digital control was the raising and lowering. The delicate MMC 20 CL required careful handling and in the previous models the arm was damped by an air cylinder to stop it falling onto the record too quickly. In the Beogram 8000 this was dispensed with, the raising device took the form of a “moving coil” actuator (like a miniature loudspeaker) that could be accurately positioned and moved under microprocessor control. Using this, the force with which the stylus came into contact with the record was set by programming, not by arbitrary mechanical constants or the viscosity of fluids. Text copyright © Beocentral. Unauthorised reproduction prohibited. The microcomputer’s final function was to allow the Beogram 8000 to be remotely controlled via the Datalink system. This arrangement was far more advanced than the simple start/stop control of the Beogram 4004 and allowed bi-directional control. Connection to the Beomaster was via a 7-pin cable that was removable, a unique feature of this series of models. The 7-pin socket at the rear of the turntable made it look as if a conventional lead could be used, though in fact a special “PH” double-screened type was needed. Text copyright © Beocentral. Unauthorised reproduction prohibited. Despite the styling success of the Beogram 4000 range, the Beogram 8000 made a complete departure and was clearly styled to provide a match with the rest of the system. The styling was clearly not as striking as that of the 4000 and has not remained in the public conscious to anything like the same extent, though it was neat and functional and offered good protection for the arm. What is beyond doubt though is the poor quality of the materials used, the lid and lid hinge in particular were insubstantial (and frequently broke) and other parts were held in place by adhesive tape, not good practice in a machine of this class. Text copyright © Beocentral. Unauthorised reproduction prohibited. The Beogram 8000 was supplemented a year later by the Beogram 6006 (for use with Beomaster 6000) and updated to become the Beogram 8002 when the new range of miniature pickups appeared. Text copyright © Beocentral. Unauthorised reproduction prohibited.